A superb pair of leather country house chairs with lions head arm rests,ebonised plates and reeded legs ending in brass castors. 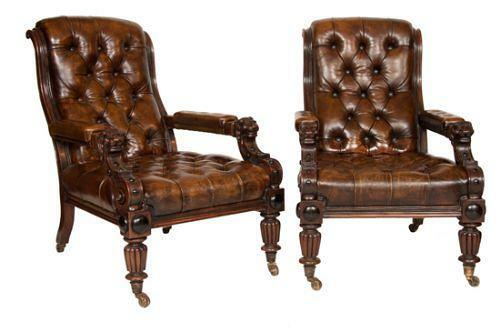 A truly superb quality pair of faded leather library chairs.The full depth of the chairs and the crisp lion headed arms make these chairs extremely comfortable and sit with real importance and stature. Structural restorations are carried out using traditional methods and materials. Minerva-Antiques promise safe, reliable and FREE delivery to anywhere in mainland UK.